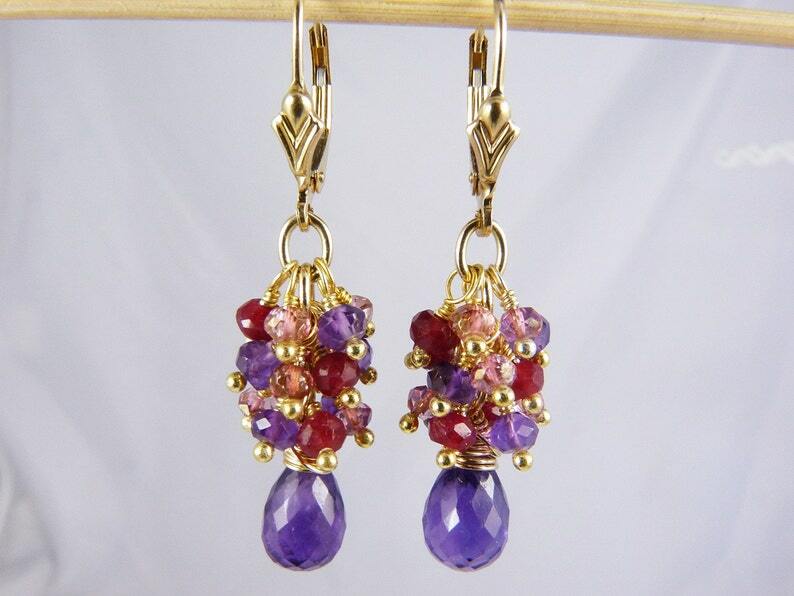 Purple amethyst, pink topaz, ruby quartz, and gold earrings. This luxurious pair of earrings features dozens of gemstones in rich purple, sparkling translucent pink, and ruby red. Microfaceted 9mm x 7mm purple amethyst teardrops are wrapped with 14KT gold filled wire and are attached to gold filled chain. Each teardrop is topped by a lush cascade of faceted purple amethyst, pink topaz, and ruby quartz rondelles. The rondelles are individually wrapped on vermeil (gold-plated sterling silver) beaded headpins. Now with FREE shipping for U.S. orders and lower priced shipping elsewhere! What you see is what you get. If you purchase these earrings, you will receive the exact same ones that are shown in the photographs. The chain and gemstones dangle 27mm (just over 1") from 14KT gold filled leverback ear wires. The earrings measure 42mm (1 5/8") from the tops of the leverbacks. These are the earrings to choose when you want to wear something dramatic, luxurious, unusual, and richly elegant! These earrings go beautifully with RazzleBedazzle's Amethyst and Amazing Lampwork Art Glass Adjustable Length Necklace with Gold and Crystals!